The first snow of the season is forecast to arrive on Sunday. A strong cold front will move into the region Sunday. This front will bring much colder temperatures with snow likely in some areas, and a cold rain mixing with snow in other areas. According to the National Weather Service, areas of Central Kansas are likely to pick up 1-3 inches of snow during Sunday afternoon and evening. Further to the west heavier snow is anticipated. The heaviest snow is anticipated across Northwest Kansas, with 4 – 7 inches possible. 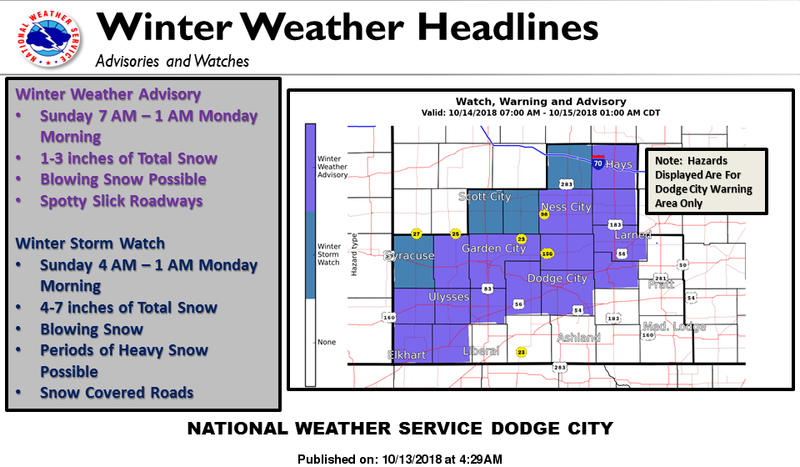 A Winter Storm Watch and a Winter Weather Advisory is in effect for portions of Western Kansas. It’s been a while since we’ve had to implement winter weather driving. If you are planning on traveling Sunday afternoon and night in western and northwest Kansas, remember to use caution on the area roadways where snow is falling.